ISTANBUL: Turkey has threatened to scrap a critical deal on halting the flow of migrants to the EU amid a spiralling war of words between Ankara and the bloc. Turkish President Recep Tayyip Erdogan yesterday said the "spirit of fascism" was running rampant in Europe, the latest in a series of incendiary verbal attacks that have left EU politicians aghast and sparked calls for moderation. 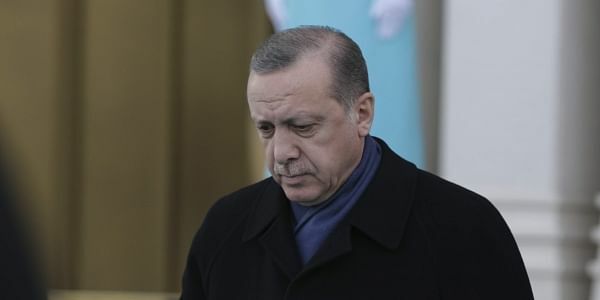 Turkey and the European Union have become embroiled in an explosive crisis after key EU members -- The Netherlands and Germany blocked Turkish ministers from holding rallies to back constitutional changes expanding Erdogan's powers in an April 16 referendum. Erdogan has repeatedly accused the two countries of behaving like "Nazis", drawing a firm response from EU chief who yesterday blasted his comments as "detached from reality" and incompatible with Turkey's ambitions to join the bloc. But far from stepping back, Erdogan ratcheted up his rhetoric a further notch, comparing the treatment of non-Europeans in Europe to that of the Jews in World War II and pointing to the rise of far-right populist politicians on the continent. "The spirit of fascism is running wild on the streets of Europe," Erdogan said in a televised speech. "Europe is heading towards being drowned in its own fears," Erdogan said. "Turkophobia is mounting. Islamophobia is mounting. They are even scared of migrants who take shelter there." Under the March 2016 migrant deal, Turkey agreed to tighten its maritime borders and also break up the people-smuggling networks that had helped migrants to make the risky crossing across the Aegean to Greece -- the starting point of the trek to northern Europe. But Foreign Minister Mevlut Cavusoglu told 24 TV in an interview that Turkey was ready to walk away from the accord given the current crisis. "We can stop it (the deal) unilaterally. We have not yet informed our (EU) counterparts, all of this is in our hands," he said. He lambasted the EU for failing to allow Turks visa-free travel in return, an incentive promised to Turkey if it fulfilled its side of the bargain. Cavusoglu said Turkey was no longer implementing a key part of the deal, whereby it took back migrants who landed on the Greek islands as a deterrent. "Right now we are not implementing the readmission agreement as there is no visa-free travel," said Cavusoglu. The deal has been praised for preventing a repeat of the surge of migrants seen into Europe in 2015 that fanned the popularity of the far-right.